There are a number of different ways to side your tiny house. Perhaps the most “traditional” (if we can even use such a word when referring to tiny houses) is the cedar clapboard made popular by Tumbleweed Tiny Houses. But lately new materials have been popping up and making a beautiful showing including vinyl siding as seen on Austin Tiny House and the TruWood product seen on the Clothesline Tiny Homes primary design. Very early on in our dreaming/designing stages we knew that weight was going to be a concern of ours. 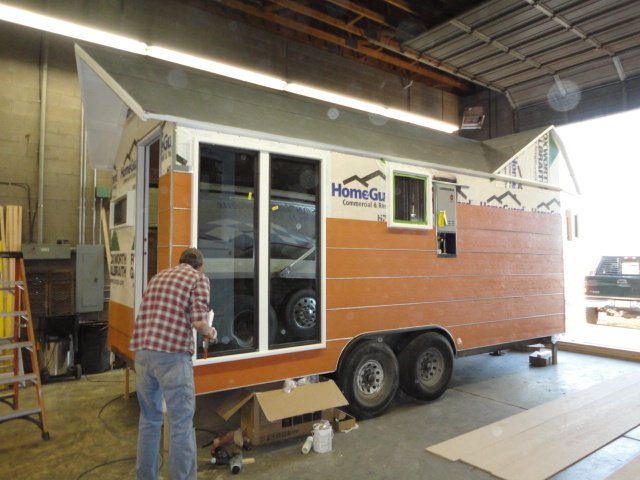 It should be a concern for every tiny house trailer builder. So we immediately began researching low weight solutions. We at first believe that we would have to have a layer of sheathing around our frame and then put on our siding choice. But as we continued to research things like pole barns, livestock barns, sheds, Amish constructs, etc. we realized this didn’t have to be the case. We landed upon a product for non-residential structures. The intent for a product like is that the product is most suited for small structures like sheds and micro-offices….not homes. But then again, most folks don’t choose to live in a home that is about the same square feet as a shed! And thus began our pursuit and eventual partnership with LP Building Products. LP Building Products is a leading manufacturer of high quality building materials. Builders and homeowners use our products primarily in new construction, repair and remodeling, and manufactured housing. LP products are sold through distributors, dealers, professional lumberyards, and retail home centers. We were fortunate enough to work with a team in their Nashville headquarters. Since our initial consultation with LP we felt LP SmartSide with Silvertech (7/16″ 8″ o.c. wood grain texture exterior 4’x8′ sheets) would be most suited for our home. We have not been disappointed. With its natural warmth and beauty of traditional wood as well as a deep cedar pattern and wood grain texture, the SmartSide has allowed us to have an old country/aged cottage look on our tiny house. We couldn’t be happier. For those wondering how SmartSide compares to other similar looking products such as Masonite or T1-11 I encourage you to revisit this post. In terms of sustainability (which is hugely important to us and many in the tiny house community) I point you to LP’s own sustainability report which outlines the economic, social, and environmental actions made by LP. And now I invite you to sit back and watch as I attempt to share with you just how to apply siding to your tiny house! You can also see photos of our siding application here. If you enjoyed this post or feel it may help another, please do LIKE it, SHARE it, +1 it, Tweet it, or email it. We appreciate folks like you and would welcome all new members to the Tiny r(E)volution community! Great video! Love how clear your explanations are. Will you put insulation in as usual between the exterior siding and the interior walls? So glad for this topic. Very timely and very well delivered. I was concerned over the weight of sheathing on stud walls PLUS the outside siding. This solves the question I had. Thanks very much! You are very welcome John. Thank you for stopping by Tiny r(E)volution. If you have any questions regarding even the product we used, please feel free to email us or click on the LP ad on the rightbar. It will take you right to the product we incorporated! Looks like a great siding product, the perfect choice if both looks and weight are a consideration. It’s very new to me to imagine building “without” that extra layer of sheathing… Keep us posted on the overall rigidity of the structure, especially after any transporting of your tiny home. As with all of our sponsors I will be updating at construction, 3-months, 6-months, 12-months, and then 3-years. HAHAHA. I wonder if anyone will care in 3 years? HAHAHAHA. I have to say Kevin, the rigidity is pretty amazing. I put it through its paces. I am actually thinking of sandblasting a piece on video to show how tough this stuff is. I think too you raise a good point. Would I use just this on a larger, stationary home? Perhaps not. But the framing system of a tiny house (along with weight restrictions) make this product almost perfect, in my opinion. What are your thoughts? Also, did you read the post linked in the post above? It was comparing masonite, T1-11, and SmartSide? different types of products BTW. I’m actually quite torn on the sheathing still. the traditional hammer practically required drilling a pilot hole first. I totally understand the carpenter in you as I am working alongside my dad on this project and oftentimes we have a “difference of opinion” because he is coming from one perspective and I from another. And to be honest, I think that is one of the stumbling blocks for many when it comes to tiny house. Tiny housers tend to oversimplify and overlook while traditional carpenters tend to overbuild. A middle ground will be reached one day though! Glad you’ll be here in 3 years! WOW Drew I can’t believe how fast you guys are getting this done… You must have lots of time to devote? You may sense a wee hint of envy, as I can’t believe how *slowly* I am getting mine done. 😉 Learning curves are super steep, especially when working (mostly) alone. Lots of opportunity for growth! Keep up the good work! No, not lots of time to devote actually. We set aside a 6 day period (2 weekends and 2 business days) and then 2 evenings (after our “day jobs”) with the resolve, plans, and commitment to dry out tiny house in. It is important to remember that we have been planning for almost 2 solid years how this week would go down so we approached it with a very concise plan. Yeah, neurotic, I know. HAHAHAHAH. I think you are moving fast. I mean, there is no black or white in tiny house building so you are operating on what you know, when you know, and with the resources you have. All of our materials were cut, laid out, stacked, etc. and our blueprint was concise, etc. You are right. Learning curves are steep….for all of us I might add. When your only experience is in sticks ‘n bricks construction and weight is never a concern you kind of have to rethink so many things. Every inch and pound coutns as you know! Thank you for your sweet comments and your support. We love watching you and following you too! I have one problem with the video. For some reason I can only hear your voice from the left. The product sounds like a great option. Yes, unfortunately that was my fault in exporting the video. Please accept my apologies. Very informative, thanks for introducing this product as a choice for our projects. You are so welcome Katie. Thank you for joining our community and taking the time to learn about a new product. I am a HUGE fan of LP SmartSide and will undoubtedly use it in future projects!